A CCTV image has been released of a man believed to have been involved in a fatal shooting. Daniel Shaw, 28, was found dead on 25 March 2018 in Copland Place, Tile Hill, Coventry. 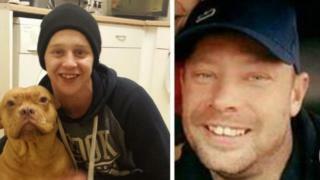 His death is linked to the disappearance of Johnny Robbins, 33, who police believe to have been tortured and murdered. Officers want to trace a man, pictured in a motorcycle helmet, seen close to Mr Shaw's address at the time. Image caption The man in the motorcycle helmet was seen on CCTV outside Mr Shaw's address before the shooting. West Midlands Police said it wants to establish his role in the events. Det Ch Insp Chris Mallett said the force also wants to trace two women, who were in the Torrington Road area at the time, one of whom was heard to shout "run". Ten people have been arrested for a range of offences and released while investigations continue, police said. Police also appealed for sightings of suspect Ryan Hobday, 29, but said evidence suggests he may also have been murdered. Det Ch Insp Mallet added, although Mr Robbins' body had never been found, it was believed he was taken to Mr Shaw's home at some point. The force is also circulating an image of his dog, who was found in Crackley Lane, Warwickshire, on 23 March 2018. It said the area was of "great interest" and also appealed for information about a white BMW 1 Series found burned out by the entrance to Crackley Woods a day later.